(Nanowerk News) Information technologies of the future will likely use electron spin -- rather than electron charge -- to carry information. But first, scientists need to better understand how to control spin and learn to build the spin equivalent of electronic components, from spin transistors, to spin gates and circuits. Now, Harvard University researchers have developed a technique to control and measure spin voltage, known as spin chemical potential. The technique, which uses atomic-sized defects in diamonds to measure chemical potential, is essentially a nanoscale spin multimeter that allows measurements in chip-scale devices. The research is published in Science ("Control and local measurement of the spin chemical potential in a magnetic insulator"). "There is growing interest in insulating materials that can conduct spin," said Amir Yacoby, Professor of Physics in the Department of Physics and of Applied Physics at Harvard John A. Paulson School of Engineering and Applied Sciences and senior author of the paper. "Our work develops a new way to look at these spins in materials such as magnets." In conducting materials, electrons can carry information by moving from point A to point B. This is an electric current. Spin, on the other hand, can propagate through insulating materials in waves -- each electron standing still and communicating spin to its coupled neighbor, like a quantum game of telephone. To drive these waves from point A to point B, the researchers needed to develop a technique to increase the spin chemical potential -- spin voltage -- at a local level. "If you have a high chemical potential at location A and a low chemical potential at location B, spin waves start diffusing from A to B," said Chunhui Du, a postdoctoral fellow at the Department of Physics and co-first author of the paper. "This is a very important concept in spintronics, because if you are able to control spin-wave transport, then you can use these spin waves instead of electrical current as carriers of information." The researchers used two spin-wave injection methods: in the first, they applied fast-oscillating, microwave magnetic fields to excite spin waves. In the second, they converted an electrical current into spin waves using a platinum metal strip located at one end of the magnet. "What's remarkable is that this material is an insulator; it doesn't conduct any current and still you can send information in the form of spin waves through it," said Toeno Van der Sar, a postdoctoral fellow at the Department of Physics and co-first author of the paper. "Spin waves are so promising because they can travel for a long time without decaying, and there is barely any heat produced because you don't have moving electrons." Once the team injected spin waves into the material, the next step was to figure out how to measure information about those waves. The researchers turned to nitrogen-vacancy (NV) defects in diamonds. These defects -- in which one carbon atom in a diamond is replaced with a nitrogen atom and a neighboring atom is removed -- can be used to detect minute magnetic fields. 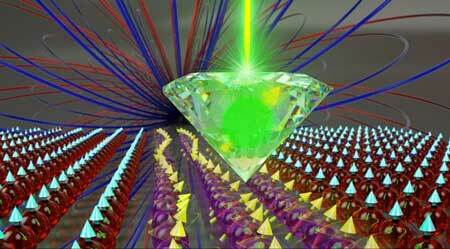 The researchers fabricated tiny rods of diamond containing NV centers and placed them nanometers above the sample. As the spin waves move through the material, they generate a magnetic field, which is picked up by the NV center. Based on NV-center measurements, researchers can now figure out the spin chemical potential, the number of spin waves, how they are moving through the material and other important insights. "The nice thing about this technique is that it's very local," said Van der Sar. "You can do these measurements just a few nanometers above the sample, which means that you can spatially study the chemical potential in a chip-scale spin-wave device, for, let's say, a spin-wave computer. This is not possible with some of the other state-of-the-art techniques." This system could also offer a glimpse into more exotic physics such as the spin-wave Hall effect, or show that spin-wave transport is hydrodynamic. "The principle we use to control and measure the spin chemical potential is quite general. It opens ways to study more exotic spin phenomena in novel materials and aids the development of new spintronic devices," said Du.